My favourite food shops are smelling heavenly and my first Christmas party is under my belt (apple tarts and amazing choc ices) so I can no longer ignore the fact that Christmas is upon us. Christmas puddings are squirrelled away (if they taste good I'll post the recipe in 2012) and attention turns to mince pies. But let's not get ahead of ourselves, there's the mincemeat filling to be considered first. There's nothing wrong with using a good jar of mincemeat, and you can always add some extra ingredients to make it more to your taste. This year I was persuaded to make my own, whereas I would normally buy it from Neal's Yard Dairy . If you live in London, they keep a particularly good mincemeat at this time of year and you can buy it in whatever quantity you want. The fact I had some lovely lovely lemon peel which I'd candied in summer and some dried fruit from Christmas pudding making convinced me to have a go. Mincemeat has been popular since the middle ages and originally included meats such as tripe, beef or tongue mixed with dried fruits and spices. Having friends in Alaska, I know that Reindeer meat is still used in some of their mincemeat recipes. These days beef suet is more commonly added. This, of course, makes it a no-go area for vegetarians, although you can buy a 'vegetarian suet' now. I've used butter instead in my recipe to provide the necessary fat content and keep everyone happy, and it works very well. 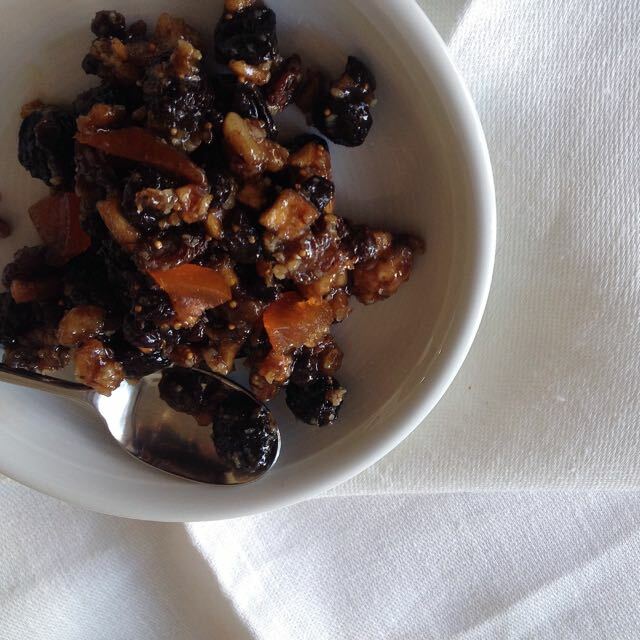 For those of you who have the time and inclination - the list of ingredients looks long but it takes little effort - here is my recipe for mincemeat. You can use either butter or suet and if you prefer one fruit over another then just change the recipe to suit your taste. Once mixed, cover the bowl and let it mature for a couple of days. You can then keep it in the fridge for a week or so or fill sterilsied jars for longer keeping. Mix together all the ingredients. Taste - add a little lemon juice if you think it needs sharpening up. Cover the bowl and leave to macerate for 2-3 days, then keep covered in the fridge for a week or so, or pack into sterlised jars for longer keeping.